You grabbed the championship after pulling off a comeback. How do you feel? I practiced really hard but I got the thought that I was going to lose when the score became 0-3. But I think the reason I was able to win was because I made sure my mentality stayed intact. I am really glad. I got so emotional that tears started flying down. The next time I win a championship, I will make sure I don’t cry. How did you approach the match after the score became 0-3? After I lost game three, I almost lost my mind. I was able to regain my focus a little after my teammates, supervisor, and the coach helped me out. In the supervisor’s case, he actually made jokes and made me feel at ease rather than be strict with me like usual. The coach and my teammates told me stories as they encouraged me. Games one two and three showed you getting taken down with just one push. I was hit with a proxy rax build in game one and I thought that my mentality was in check, but I think it actually got taken down a notch. I think my mentality just kept on falling after game one and so it influenced my games. I wasn’t planning on going for all-in for game three but I was feeling pressured so I ended up doing it. I think that’s why I lost. According to many overseas opinions, INnoVation was the top dog. What did you think? If I won game one today, then I expected to win the series pretty easily. But I think this win was such a difficult 4-3 because I lost game one. I was feeling confident because I prepared my hardest ever for today’s match. I thought to myself that I was going to win today even before arriving at the finals. While preparing for the finals, it was stated that Flash and MMA were helping you? Prime’s ByuN also helped me out and gave me advice. MMA hyung helped me out a lot and helped out with build orders. Flash also practiced with me and helped me out a lot. I especially think I need to treat MMA hyung to a meal. I wish he had stayed in the team house longer. What do you think happen at the season finale? I think the season finale is going to get more difficult. But I have a feeling that I’m going to be able to use this championship as a trigger to work even harder from here on out. There were a lot of series where you had to play until the very last game this season. What was the driving force behind your victory today? If it was me from the past, then I would have lost 0-4 today. But my mentality has improved so much since then and my desire to win a championship has grown so much since then. My thirst to win the championship was so much bigger than back then so I think that’s why I was able to win. In your Proleague match, you lost against INnoVation. Did that loss affect you? I lost that Proleague game because I was the one who made the mistake, so it didn’t affect the match today. My game four build was actually a twist on that Proleague match’s build. I think that’s why I was able to win. KassiA recommended that build order to me. The end result was really good. You had a chance to use nydus plays but you didn’t. Did you cross them off your list even before the match began? I don’t like nydus plays to begin with. I did think about the possibility of using nydus plays, but after I watched INnoVation’s match vs Symbol , I figured that INnoVation was more than prepared for them so I decided not to use any nydus plays. Didn’t you feel tempted to go for a 6 pool for the final game? I used a build order I had no intention of using for game three, and then I lost that game because I went for an all-in so I had no desire to go for an all-in for game seven. I also got lucky and I felt confident enough to win. There is a pattern where if a player wins the championship, he plays badly for the next season. There are players who disappear into thin air after winning a championship, and there are players who keep remaining in fans’ memories. I want to become that kind of player so I am going to keep working hard from here on out. In Japan, there was a barcraft that was showing today’s finals. Please say something to your overseas fans. I don’t think many overseas fans know me that well yet. I really hope that today’s victory brought me a lot of attention from overseas fans. If I do attend any overseas events in the future, I hope a lot of people will cheer for me. For the first time ever, you won big prize money. How do you plan on spending it? I didn’t really feel greedy for prize money to begin with. I just came here with the desire to win a championship so I just plan on sending the prize money home. I also want to repay teammates and friends who helped me out throughout all this time. Any specific player or race you want to face for the season finale? I am not sure who even made it to the season finale for overseas. I really don’t know anything about the players either. But I can’t but feel like the tournament will be Korean players only in the end. Everyone in that tournament is going to be a good player so I don’t really have anyone I want to face. I just think that the season finale is going to be difficult. Your first time winning a championship, and you are the first HotS champion. I feel so honored being the first champion. I want to use today’s championship to become a player who remains in people’s memories forever. I think the release of HotS was such a good thing. I want to thank Blizzard for creating HotS. Exactly what made you do so well in HotS? Everything was the same in the beginning but as I’ve always stated, it was because of Light hyung. I was able to realize the concept of the game because of him and I gained confidence. I also think the fact that I had fun playing the game had something to do with it. In fact, Light hyung created almost all my build orders I used today. I am always grateful to him and my Terran teammates who helped me out with practice late into the morning. I especially want to thank Rudy and BrAvO. Woongjin Stars has an excellent record for Proleague. Do you expect to win the championship? I don’t think there’s that much to go until we secure 1st place. If our team can just burst out and do our best that we can secure first place and win the championship. If our team can win the championship after I just won WCS Korea, then this season would become the best season ever. I will work hard so that we can win the Proleague championship also. I want to thank the coach for helping me with preparations for today’s match. I don’t really get chances to thank the supervisor for always taking care of me so I want to take this moment to do so. I want to thank all my teammates and say that I hope we can all work real hard together so that we can win the championship. I want to thank our fans for always encouraging us on and hope that they keep on cheering for us from here on out. I had a lot more that I wanted to say if I won the championship, but now that it’s actually happened, I can’t seem to remember. I still cannot get over that trophy. I guess it is better than the MLG one lol. I wish there was more continuity between the actual trophies of each organizer as well. I know the GSL used it for RorO as well at the end of WoL but there has been a progression between everything from MLG to DH to the GSL. Good thing a lot of Koreans don't speak good English. It's very important to block out all these opinions and stay the course. Humor can be a very effective tool and I'm glad he took it the right way. It's great when you play like there is nothing to lose and it couldn't have gotten any worse than the 0-3 start. Good winning mindset. Kinda funny how they think of Japan as overseas. I guess everything is overseas for South Korea except North Korea. I don't think he will drop off completely, but I do think he will fade a bit as time goes on. Innovation I think will still be pretty solid, unless he was seriously traumatized by the finals loss. I'd probably retire if I lost in the way he did, heh. I really hope for a finals rematch this upcoming finals, though. I think Innovation will take it, if it does happen, though. Japan is quite literally a sea away. More love for this interview please. Took me a long time to translate. MMA stayed at WJ teamhouse? I hope it helped him as much as it helped SK. Thanks Seeker For some reason I missed this thread. Reading now. Using the word "Grand" in the title is misleading, since this is only the code S finals and the season finals is still coming up ... and then the global finals later on. The reason why this use of the word is bad is that people will run out of superlatives for the next (and bigger) events. Still can't believe Soulkey came back from such a deficit. The Woongjin Stars supervisor and coach must be awesome at pep talks. *hugs the interview* enough love ? :3 thank you Seeker was waiting for it. And evil MMA and Flash, lets help the Zerg so Innovation doesn't get us nerfed. Happy that he won. I find the foreign community really harsh with SK. TL thought that Innovation should won, so it was impossible that he loose. So, now, it seems that everybody on the site sulk Soulkey and his victory. It seems like a real champion must be terran, and a zerg never deserve that title. 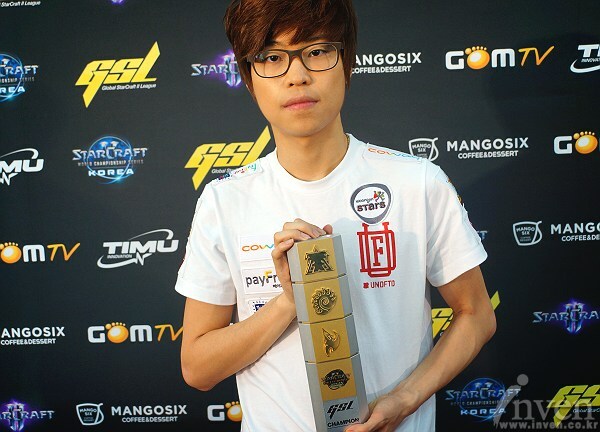 Also, some day, a Terran will win a GSL again. The rightful order will be restored.